Fick&CloseCurlyQuote;s law of diffusion, given below, describes changes in concentration of solutes due to diffusion. This Demonstration explores the rate of diffusion throughout pregnancy between the fetus and mother at the terminal villi of the placenta. Use the sliders to control the three relevant variables. The rate of diffusion depends on the constant diffusing capacity of oxygen , the surface area (which changes with the time of gestation), the partial pressure difference of oxygen between the fetus and the mother and the thickness of the villi (a genetic trait that can vary among individuals). Specifically, . 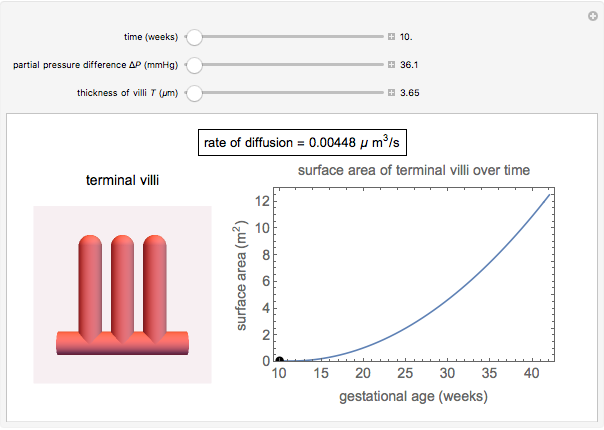 In the graphic for this Demonstration, the rate of diffusion is shown numerically at the top, the rate of diffusion is shown as a visual representation of terminal villi in the placenta and a plot shows the relationship between surface area and time. 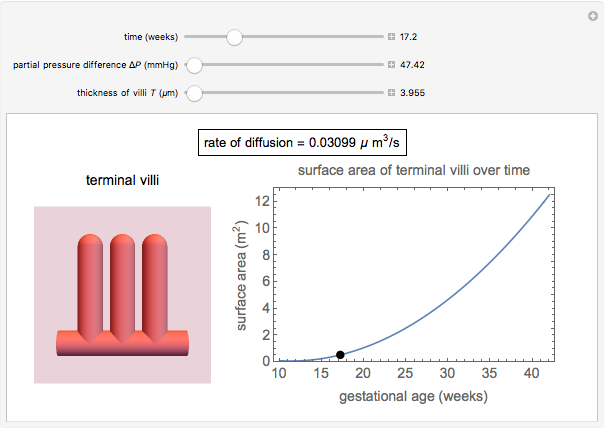 The rate of diffusion, calculated using Fick&CloseCurlyQuote;s law, is determined by the partial pressure difference in oxygen between the mother and the fetus, the thickness of the villi, the diffusion capacity of oxygen and the surface area. The picture of the terminal villi shows the change in the rate of diffusion as the partial pressure difference, thickness or time, as set by the sliders. The shade of red of the box surrounding the villi is indicative of the partial pressure difference, with a darker shade of red indicating a greater partial pressure difference. Finally, the plot is able to show that, with increasing time, surface area of the placenta increases, which in turn increases the rate of diffusion of oxygen. W.-Y. Lim et al., &OpenCurlyDoubleQuote;Maternal Blood Pressure During Pregnancy and Early Childhood Blood Pressures in the Offspring: The GUSTO Birth Cohort Study,&CloseCurlyDoubleQuote; Medicine, 94(45), 2015 e1981. doi:10.1097/MD.0000000000001981. T. McNanley and J. Woods, "Placental Physiology." (Apr 10, 2018) www.glowm.com/section_view/item/195. Y. Wang and S. Zhao, "Cell Types of the Placenta," in Vascular Biology of the Placenta, San Rafael, CA: Morgan & Claypool Life Sciences, 2010. (Apr 10, 2018) www.ncbi.nlm.nih.gov/books/NBK53245. Colleen Tacubao, Patrick Chen and Hazel Wong "Diffusion of Oxygen through the Placenta"